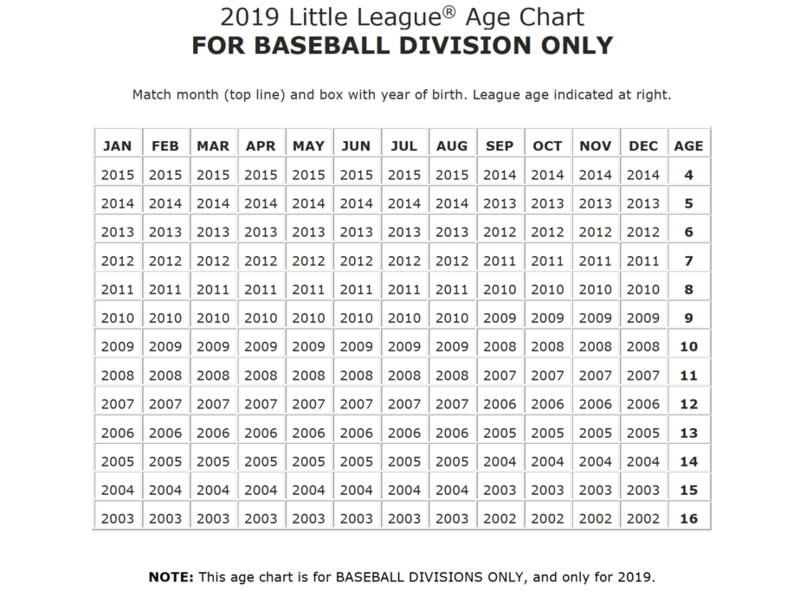 Little League baseball age is the age of a player based on the table above. T-Ball (5- to 6-year-olds): Instructional, non-competitive, no pitching, no scorebook, no try out necessary. League age 4-year-olds are not eligible to play. A player must be 5 years old on or before 8/31/2014. Official government birth certificate is required. 7-year-olds can play down in T-Ball pending a safety evaluation. $100 per player. Minor A and AA (7- to 8-year-olds): Instructional, non-competitive, coach pitch and introduction to player pitch. Minor A and AA is divided into two categories, A (primarily 7-year-olds) and AA (primarily 8-year-olds). A is coach pitch. AA is player pitch, a coach will pitch if a player pitcher issues four balls outside the strike zone to the batter. 6-year-olds can play Minor A if they have played T-Ball for one year and pending a safety evaluation. 7-year-olds can play Minor AA pending a safety evaluation. $135 per player. Minor AAA (9- to 10-year-olds): Minor division, introduction to competitive baseball, player pitch, scorebook, no standings. 8-year-olds can play AAA if drafted and pending a safety evaluation. 11-year-olds and 12-year-olds can play in AAA if the Safety board determines it is the correct level for the player. $160 per player. Major (11- to 12-year-olds): Major division, competitive baseball, scorebook, standings. 10-year-olds can play Majors if SCLL is notified at time of registration and if drafted. Returning Major players may need to try out again in 2016 depending on the number of teams. Please check back to the calendar page for more information in January. $160 per player. Intermediate (50/70 division for 13-year-olds): Competitive baseball. Intermediate baseball spanning gap to 90' bases. $185 per player. Intermediate players will be contacted individually and notified of the try out date and time. See the Intermediate page for program details. Junior/Senior (13- to 16-year-olds): Competitive baseball. Practice and games start after Spring Break. $185 per player. Junior/Senior players will be contacted individually and notified of the try out date and time.